Dumaguete, officially the City of Dumaguete, (Cebuano: Dakbayan sa Dumaguete; Tagalog: Lungsod ng Dumaguete), or simply as Dumaguete City, is a 3rd class city in the province of Negros Oriental, Philippines. According to the 2015 census, it has a population of 131,377 people. Dumaguete is referred to as a university city because of the presence of four universities and a number of other colleges where students of the province converge to enroll for tertiary education. The city is also a popular educational destination for students of surrounding provinces and cities in Visayas and Mindanao. The city is best known for Silliman University, the first Protestant and American university in the country and in Asia. There are also 18 public elementary schools and 8 public high schools. The city's student population is estimated at 45,000. Dumaguete attracts a considerable number of foreign tourists, particularly Europeans, because of easy access from Cebu City in Central Visayas, the availability of beach resorts and dive sites, the attraction of dolphin and whale watching in nearby Bais City. Dumaguete is listed 5th in Forbes Magazine's "7 Best Places to Retire Around the World". The Philippine Retirement Authority a government agency under the Department of Tourism has named the city as the Best Place to Retire in the Philippines for 2018. The power source of the city comes from the geothermal power plant in Palinpinon, Valencia. The city has redundant fiber optic lines and is a focal point for telecommunications. It is the landing point for fiber optic cables linking it to the whole Visayas, Manila (the capital of the nation) and cities south of Luzon, as well as to other cities north of Mindanao. Scholars have been pushing for the city's inclusion in the tentative list of the Philippines for future UNESCO World Heritage Site nomination. As of the census in 2015, there are 131,377 people and 21,582 households residing in the city (as of 2010). The city has the least poverty incidence among urban centers in Visayas, according to the 2009 Small Area Estimates (SAE) of Poverty done by the National Statistical Coordination Board (NSCB). It has an average daylight population of 400,000 people. Dumaguete is the most populous city in Negros Oriental, comprising 9.05% of the province's total population. Its total voting population is 80,122 voters (2016). Dumaguete is best known for Silliman University. Other universities within the urban parameters of the city are: Foundation University (1949), a private non-sectarian university, its Main Campus where the site of a very popular Sofia Soller Sinco Hall dubbed as White House of Dumaguete is located at Meciano Road offers tertiary education programs while North Campus along Locsin Street is the home of Foundation Preparatory Academy for basic education programs. The Negros Oriental State University (NORSU) which was founded in 1907, has its two main campuses in the city, the Main Campus 1 is beside the Provincial Capitol building while Main Campus 2 is located in barangay Bajumpandan. It is the only state university in Negros Oriental, the biggest among the four universities in the city in terms of student population and is very popular among students from different towns and cities of the province and some other parts of the country. St. Paul University Dumaguete (1904) is the first Saint Paul educational institution to be established in the Philippines by the Sisters of Saint Paul of Chartres (SPC) from France, second oldest Catholic university of Central Visayas and considered as premier Catholic university of Dumaguete City. SPUD is best known for its core academic courses like Nursing, Teacher Education,Mass Communication, Tourism,Arts & Culture Education,Hospitality Management, Business and Accountancy. Data from the Department of Tourism show that Dumaguete and Negros Oriental are among the top ten most visited tourist destinations in the country. Tourists visit popular sites such as: the historic Rizal Boulevard aligned with some hotels, coffee shops, fine-dining restaurants and bars including the latest dining commercial complex, Paseo Perdices is the preferred location of Max's Restaurant, Yellow Cab Pizza and among others; Silliman Hall-home of University's Anthropology Museum; St. Catherine of Alexandria Cathedral being the oldest stone church of the island of Negros and ecclesiastical seat of the bishop of Roman Catholic Diocese of Dumaguete and Campanario de Dumaguete which is considered as one of the oldest heritage landmarks of Negros Island and Central Visayas. Dumaguete serves as the main gateway to Negros Oriental. The city comes alive every September by celebrating its Sandurot Festival, which means “fellowship and reaching out” is a commemoration of Dumaguete’s rich history dating back from the pre-Hispanic period when people of different foreign cultures converged and created a varied community that is Dumaguete City today. Through the course of history and to the present time, the people of Dumaguete have always been known to welcome strangers from different shores and countries, and to live with them in complete peace and understanding. The celebration started with the Paghimamat, a re-enactment of how people from different cultures and races came to the shores of Dumaguete, bringing gifts of rich cultures. Pasigarbo followed, gracing the City streets with dancing to drumbeats and other instruments participated by different barangays and schools in Dumaguete. The streetdancing ended at Quezon Park after which the participants prepared for the grand Pasundayag, a display of dances portraying different stories of the Dumaguete tradition. Meanwhile, Buglasan Festival also known as Festival of all festivals is celebrated annually in the province of Negros Oriental every October since 2002. The festival is a ten-day event held in the city of Dumaguete, a movable provincial fiesta, participated in by the Province's six cities and 19 municipalities. Though this is a province-wide event (sponsored by the provincial government), the activities are mostly centered in the province's capital, Dumaguete City. Majority of activities are held in the Provincial Capitol and Ninoy Aquino's Freedom Park with booths and local products either on display or for sale, it is also spread to other venues such as Sidlakan Negros Village at Brgy. Piapi and city's Rizal Boulevard. Showdowns and streetdancing activities happen every 3rd Friday of the month of October. Dumaguete's outsourcing industry has a range of businesses, such as call centers, publishing, medical transcription, animation, editing, and architectural outsourcing. Dumaguete City has over 20 IT and BPO locators, and has been described as a hub for Business Process Outsourcing and Information Technology. The upcoming Festival Mall Dumaguete at Escaño Beach, Piapi (North Boulevard) will be one of the major components of Filinvest's township project called Marina Town Dumaguete. As of June 30, 2018 (data from PDIC), deposits in the city's banks reached a total of 39.5 billion pesos. Most of the major Philippine banks, as well as the Bangko Sentral ng Pilipinas (the central bank), maintain branches in Dumaguete. 7. BPI San Jose St. In addition, One Network Bank (BDO's rural bank subsidiary) and BPI's 4th branch are set to open soon. A tricycle in Dumaguete, one of the primary modes of public transport in the city. Sibulan Airport (IATA: DGT, ICAO: RPVD), also known as Dumaguete Airport or Dumaguete-Sibulan Airport, is the city's domestic airport located in neighboring Sibulan town in the north. It provides daily flights to and from Manila and Cebu City through Cebu Pacific, Cebgo and PAL Express while Cebgo is servicing both Mindanao important urban centers, thrice weekly flights to Davao City and Cagayan de Oro City. However, a new airport is being planned to be built in Bacong, a town bordering Dumaguete in the south The proposal for the transfer and upgrading of this airport to international standards has already been approved and should be completed before 2025. An initial PHP 500 million budget has already been released for initial study and procurement of free lands. Dumaguete, as a major port city is a jump-off point for passengers/tourists who are going to other Visayas and Mindanao areas. There are daily ferry connections to the islands of Cebu, Bohol, Siquijor and Mindanao operated by Archipelago Philippine Ferries Corporation (Fast Cat), Montenegro Lines, Medallion Transport, Ocean Jet Shipping, Cokaliong and other companies. Dumaguete is an access city for passengers/tourists going to Cebu which is dubbed as economic hub of the Visayas. There are smaller ports north of the city where short and frequent ferry connections are available to that island as an alternative. Dumaguete is a port of call for travelers to Manila, Dapitan and Zamboanga City by ship serviced by 2GO Travel. ^ a b c "Dumaguete City, the City of Gentle People". Department of Tourism. Retrieved 2010-11-04. ^ "CSF program up in Dumaguete" Archived 2009-07-19 at the Wayback Machine. Manila Bulletin. By Atty. Ignacio Bunye. Posted July 5, 2009. Accessed October 14, 2009. ^ "Heritage Diary of Negros Oriental". Inquirer.net. By: Dexter Matilla. Posted July 14, 2008. Accessed October 15, 2009. ^ Dumaguete among 7 best places to retire, according to Forbes Magazine. GMA Network. November 15, 2014. ^ "Dumaguete City, Negros Oriental Climatological Normal Values". Philippine Atmospheric, Geophysical and Astronomical Services Administration. Archived from the original on 13 October 2018. Retrieved 13 October 2018. ^ "Dumaguete City, Negros Oriental Climatological Extremes". Philippine Atmospheric, Geophysical and Astronomical Services Administration. Archived from the original on 13 October 2018. Retrieved 13 October 2018. ^ "Dumaguete, Negros Oriental". Philippine Airlines. Retrieved 2010-09-01. ^ UP is No.1 based on PRC exams Archived February 7, 2012, at the Wayback Machine. UP Newsletter, Vol. XXVIII, No. 09. September 01, 2007. Accessed May 26, 2009. ^ Philippine Travel Center: Negros Oriental. Accessed September 1, 2009. ^ Negros Chronicle. Where to go in Negros Oriental Archived 2016-05-27 at the Wayback Machine. Accessed September 1, 2009. ^ WOWPhilippines: Things to do and see in Negros Oriental. Accessed September 1, 2009. ^ "Lee Plaza Shopping". Lee Plaza Shopping. Retrieved 2017-02-16. ^ "St. Luke's inks MOA with Silliman Medical Center". Philstar.com. Retrieved 2010-04-28. ^ "CEB adds 2nd daily frequency to Manila-Dumaguete " Archived June 18, 2011, at the Wayback Machine. Cebu Pacific. Retrieved 2010-11-04. "Dumaguete" . New International Encyclopedia. 1905. Christine Marie "Beauty" Gonzalez-Crisologo (born 28 May 1989) is a Filipino actress from Dumaguete City. She was tagged as the "Rebellious Beauty" when she joined the reality show Pinoy Big Brother where she became the 4th grand placer of Pinoy Big Brother: Teen Edition Plus. Beauty was the first housemate from Pinoy Big Brother Teen Edition Plus to have an appearance in a Teleserye after exiting the Big Brother house. Her biggest break was being cast as Zanjoe Marudo's leading lady in the ABS-CBN Primetime Teleserye, Dream Dad. The unexpected success of their loveteam led them to be tagged as "BaLex", a combination of their characters' names Baste and Alex in the teleserye. She posed for August 2014 issue of FHM Philippines. In 2017, she headlined her first major lead role in Pusong Ligaw alongside Bianca King. She then signed her first ever contract with ABS-CBN in August 2018. Carmita Martin also known as Carmi Martin (born 7 August 1963 in Dumaguete City, Philippines) is a Filipino actress. DYMA-TV is a commercial television relay station owned by ABS-CBN Corporation. Its studio is located at Dr. V. Locsin cor. Libertad Sts., Dumaguete City, Negros Oriental and its transmitter is located at Valencia, Negros Oriental with an effective-radiated power of 30,000 watts. The station had previously as an originating station on August 28, 1995, which aired TV Patrol Dumaguete until its cancellation on December 30, 2005 upon its merger with TV Patrol Central Visayas on January 2, 2006, led to become a relay station from TV-3 Cebu. DYSR-FM, branded as SR95, is an FM radio station owned by the National Council of Churches in the Philippines. DYSR-FM broadcasts in the frequency 95.1 MHz with studio and transmitter located at Camp SEA Site, Brgy. Banilad, Dumaguete City. DYSR is notable to be the oldest radio station in Dumaguete (in terms of AM and FM stations broadcasting there), being launched on August 26, 1950 in the AM band. The station was formerly broadcast at 840 kHz from its inception until the Philippines switched AM spacing from 10 kHz to 9 kHz in 1979, and 891 kHz from 1979 or 1980 to 2005 or 2006. The station signs-on every 5:30 AM and signs-off every 12:00 MN. daily. The Dumaguete Science High School is a public science high school magicDumaguete City, Negros Oriental, Philippines. It is a DepEd-recognized science high school and one of three science high schools in Negros Oriental, the others being the Bais City National Science High School, Tanjay Science High School in Tanjay City, and Zamboanguita Science High School in Zamboanguita. It serves as the Regional Science High School for the Central Visayas region. Negros is the fourth largest island of the Philippines, with a land area of 13,309.60 km2 (5,138.87 sq mi). Negros is one of the many islands that comprise the Visayas, which forms the central division of the nation. The predominant inhabitants of the island region are mainly called Negrenses (locally Negrosanons). As of 2015, Negros' total population is 4,414,131 inhabitants.From May 29, 2015 to August 9, 2017, the whole island was governed as an administrative region which was officially named the Negros Island Region which comprised the highly urbanized city of Bacolod and the provinces of Negros Occidental and Negros Oriental, along with its corresponding outlying islands and islets within a total regional area of 13,350.74 km2 (5,154.75 sq mi). It was created on May 29, 2015 by virtue of Executive Order No. 183 issued by Benigno Aquino III, who was the president at that time. In August 9, 2017, President Rodrigo Duterte signed the Executive Order No. 38 dissolving the Negros Island Region. Negros Oriental (Cebuano: Sidlakang Negros; Tagalog: Silangang Negros), also called Oriental Negros or Eastern Negros, is a province located in the region of Central Visayas, in the Philippines. It occupies the southeastern half of the large island of Negros, and borders Negros Occidental, which comprises the northwestern half. It also includes Apo Island, a popular dive site for both local and foreign tourists. 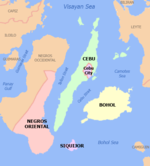 Negros Oriental faces Cebu to the east across the Tañon Strait and Siquijor to the south-east (which happened to be part of the province before). The primary spoken language is Cebuano and the predominant religious denomination is Roman Catholicism. Dumaguete City is the capital, seat of government and most populous city of the province. With a population of 1,354,995 inhabitants, it is the second most-populous province in Central Visayas after Cebu, the fifth most-populous province in the Visayas and the 19th most-populous province of the Philippines. Negros Oriental State University is the only state university in Negros Oriental, Philippines, with 7 satellite campuses. NORSU located in Dumaguete City is the main campus with most academic programs and student organizations. Formerly Central Visayas Polytechnic College, it was converted into a state university for students from Visayas and Mindanao. The Main Campus I is on Kagawasan Ave., Dumaguete City, beside the provincial capitol building of Negros Oriental. Paula Lynn Parrocho Obañana (born 19 March 1985) is a Filipino-American badminton player who was originally from Dumaguete, Philippines. In 2015, she won the women's doubles gold medals at the Pan American Games in Toronto, Canada partnered with Eva Lee. In 2016, she competed at the Summer Olympics in Rio de Janeiro, Brazil. Robinsons Place Dumaguete is a shopping mall located in Dumaguete City, Negros Oriental. It has a total gross floor area of over 45,000 square meters and located on almost 60,000 square meters of land area. It is the first full-service largest shopping mall in Negros Oriental and is a major component of the Dumaguete Business Park and IT Plaza in Brgy. Calindagan. It features an activity center, two atria, and an al fresco dining area. Located in its vicinity is a hotel and a public transport terminal which serves the commuting public coming from north and south of Dumaguete and the rest of Negros Oriental, as well as even those from the neighboring provinces of Cebu, Siquijor, and some areas in Mindanao. The mall, which opened on November 23, 2009, is the 27th shopping mall development of Robinsons Malls, a division under Robinsons Land Corporation. It was constructed by Freyssinet Philippines, Inc. and is RLC's sixth mall development in the Visayas, and second in Negros Island after Robinsons Place Bacolod. The mall has been awarded by the Philippine Retailers Association (PRA) as the Mall of the Year for 2012.In October 2015, the Department of Foreign Affairs opened a passport office at the mall's second level.The mall is currently undergoing major redevelopment and expansion. The Roman Catholic Diocese of Dumaguete (Lat: Dioecesis Dumaguetensis) is a diocese of the Latin Rite of the Roman Catholic Church in the Philippines. Sibulan, officially the Municipality of Sibulan, (Cebuano: Lungsod sa Sibulan; Tagalog: Bayan ng Sibulan), is a 2nd class municipality in the province of Negros Oriental, Philippines. According to the 2015 census, it has a population of 59,455 people.Sibulan is bordered to the south by the provincial capital of Dumaguete City. It is the location of the Dumaguete Airport, the main airport for Negros Oriental. Sibulan is also the location of the Balinsasayao Twin Lakes Natural Park, composed of Lake Balinsasayao and Lake Danao. The site, managed by the provincial government, is located 1,047 metres (3,435 ft) above sea level on Mount Talinis. Sibulan Airport (Cebuano: Tugpahanan sa Sibulan; Hiligaynon: Hulugpaan sang Sibulan; Filipino: Paliparan ng Sibulan) (IATA: DGT, ICAO: RPVD), also known as Dumaguete Airport or Dumaguete–Sibulan Airport, is an airport serving the general area of the city of Dumaguete, located in the province of Negros Oriental in the Philippines. The airport is named after its location in the adjacent municipality of Sibulan. The airport is classified as a Class 1 principal (major domestic) airport by the Civil Aviation Authority of the Philippines, the body of the Department of Transportation and Communications that is responsible for the operations of not only this airport but also of all other airports in the Philippines except the major international airports. Saint Paul University, abbreviated as SPUD or SPU Dumaguete, is a private Catholic university located in Dumaguete City, Negros Oriental, Philippines. 1904 – On October 29, 1904, seven Sisters of the Congregation of the Sisters of St. Paul of Chartres, France established its first foundation in the Philippines in Dumaguete, Negros Oriental, Philippines. The Sisters, coming from their mission in Vietnam, responded to the invitation of Bishop Frederick Rooker of the Diocese of Iloilo, to which Dumaguete then belonged. The seven Sisters were Mother Marthe de St. Paul, Superior, Sr. Marie Louise du Sacre Coeur, Sr. Ange Marie, Sr. Anne de la Croix, Sr. Charles de Genes, Sr. Catherine, and Sr. Josephine. St. Paul’s College, Dumaguete was founded as St. Paul Academy, becoming the first St. Paul’s College in the PhilippinesSt. Paul Academy which was located near the Cathedral, accepted boys and girls and prepared them for their First Holy Communion. The Sisters were installed in the old Convent of the Augustinian Recollects that Bishop Rooker had offered. The parish priest transferred his residence elsewhere. January 9, 1905, the new school opened with 30 girls (15 of whom were aged 15 to 20), four of them were boarders, and six boys. Children, women, and young men came to the school for religious instruction. Besides the regular academic courses, there were supplementary classes in music, drawing, painting, French, sewing, and embroidery. The medium of instruction was English. However, since the Americans had been in the Philippines only for five years, very few pupils were acquainted with the language. Hence, the Sisters were obliged to learn Visayan and Spanish to be able to communicate with their charges. Regional editions are published for residents in Metro Cebu and Metro Manila. The Metro Cebu edition also carries content relevant to the province of Cebu.All editions also carry national content, usually the same across all newspaper editions. TV Patrol Central Visayas (formerly TV Patrol Cebu) is the local news program of the ABS-CBN Regional Network Group in Mandaue City. It has been the most watched news program in Metro Cebu and Central Visayas as well as Dumaguete and Negros Oriental (although the latter two was formally transferred to the newly created Negros Island Region but since 2017, the region was dissolved). The program delivers news headlines about the current events in Central Visayas and Negros Oriental. It is aired live daily from the ABS-CBN Newscenter Cebu at 5:00 PM, from Monday to Friday with simulcast over Channel 9 Bohol and Channel 12 Dumaguete and on radio through DYAB Radyo Patrol 1512 Cebu and MOR 97.1 For Life! Cebu, with replays at 7:00 PM on Sky Cable Cebu Community Channel 53. It also produces its bulletin version News Patrol Central Visayas airing several times a day every weekdays. Anchored by Leo Lastimosa, TV Patrol Central Visayas had been recognized by Catholic Mass Media Awards (CMMA) as the Best TV News Program in 2005 and in 2008. It was further given recognition by Cebu Archdiocesan Mass Media Awards (CAMMA) as the Best TV News Program in 2007 and 2009. In addition, it is the only newscast in the Philippines with a using video traffic system and sign language of the news for audience with visual difficulties along with TV Patrol Palawan. They close the program saying "Mabuhi ta, Kapamilya!" literally, "we are a family!" Tanjay, officially the City of Tanjay, is a 4th class city in the province of Negros Oriental, Philippines. According to the 2015 census, it has a population of 80,532 people.It was created by virtue of Republic Act 9026 otherwise known as "An act converting the Municipality of Tanjay, province of Negros Oriental into a component city to be known as the City of Tanjay". The Act was approved and signed by President Gloria Macapagal Arroyo on March 5, 2001. This act, which is a consolidation of House Bill No. 8880 and Senate Bill No. 2256, was finally passed by the House of Representatives and the Senate on February 8, 2001. Tanjay was finally proclaimed a component city on April 1, 2001 after a plebiscite was conducted for the purpose. The city is part of the 2nd Congressional District of the Negros Oriental and is located 30 kilometers north of Dumaguete City. It is bounded on the north by Bais City, on the south by the Municipality of Amlan, on the east by the Tañon Strait and west by the Municipality of Pamplona. The municipality is home to two indigenous languages, the Minagahat language and the Cebuano language as listed by the Komisyon ng Wikang Filipino. Vallacar Transit Incorporated (VTI) is under the giant umbrella of the Yanson Group of Bus Companies (YGBC). The bus company is a family-owned and managed business that has grown from a lone 14-seater jeepney plying a single route called Ceres Liner, to a conglomerate of transportation companies with a combined number of operating units of 838 transport vehicles as of January 2010, operating and serving in the Visayas, as well as the Zamboanga Peninsula in Mindanao. The company pioneered inter-modal services between Negros and Cebu.